Larger Parrot Cages/Cockatoo Cages/Amazon Cages etc. 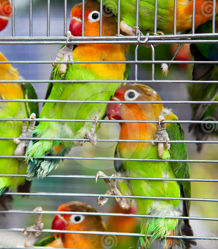 Many concerned bird owners are upgrading to large parrot cages, thereby improving the quality of life for their birds. This trend is good news for the large percentage of birds living in cages that are too small to meet their physical and mental health needs. A pet bird will spend most of his life inside of a cage, thus owners must consider their birds' accommodations just as (if not more) carefully as they would consider the setup of their own homes. Owners must remember that birds cannot control when they leave their cages, thus their cage environments always need to be comfortable. A large parrot cage can help accommodate all of the space necessary for flight, play and exercise. To the benefit of birds, many owners are now recognizing the importance of a large parrot cage to overall bird health and are prioritizing size over price when making cage decisions. 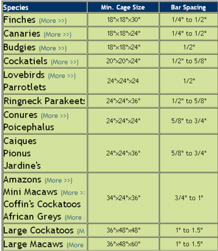 Basic Recommendations For Migrating To Larger Bird Cages For Parrots, Macaws, Conjures, Amazon, Greys, etc. There are plenty of minimal cage size guidelines for birds of all sizes; however, many owners are opting to go above and beyond the minimalist recommendations to ensure proper parrot health. In general, cages must be large enough for birds to flap their wings and fly around in. Smaller birds need more horizontal space than vertical space to encourage cage flight. But bird ownership is a serious, long-term commitment, and owners usually discover that a large parrot cage , large cockatoo cage or other large breed bird cage made of quality materials is a smart investment. Assuming the cage bar spacing is safe, the general rule of thumb is that owners should purchase the largest cage they can afford for their birds. Many bird owners agree that most of the time they feel like their birds are the ones in charge. But purchasing a large parrot cage, large cockatoo cage, large macaw cage or other large bird cage shouldn’t be viewed as a merely subservient decision. Large parrot cages improve the quality of life of birds, leading to more agreeable daily interactions and helping prevent vet visits and health problems. Today’s bird owners are more educated and are now demanding large breed cages like for parrots, macaws and others to meet the health needs of their pets. This trend has also been fueled by empathetic owners who are sensitive to how captivity contradicts the natural tendencies of their birds. Because of this understanding, owners not only will offer plenty of opportunities for their birds to spend time outside of their cages, but they will also provide their birds with larger parrot cages, larger cockatoo and macaw aviaries and the like for the majority of the day they are confined to these spaces. While price remains a driving factor in birdcage purchasing decisions, retailers are trying to ensure owners still select an appropriate, healthy cage match for their birds. Ideally, an owner should plan on purchasing a larger parrot cage/cockatoo cage/macaw cage etc. made of quality materials. However, if owners have a strict birdcage budget, responsible retailers tend to encourage size over construction. Other bird owners are interested in how easy the cage is to clean or how it will match their home décor. While these factors are nevertheless important, they should not be prioritized over cage size. Some retailers, when faced with a customer who is overly concerned about a cage’s looks, will explain that insufficient cage size leads to health problems that affect a bird’s appearance. In other words, their fashionable cage could end up holding an unhealthy bird with frayed wings. A large parrot cage, cockatoo cage or other large breed cage is the foundation to healthy avian living, and it is the retailer’s responsibility to help new owners empathize with their birds and consider cage environment from a bird’s perspective. While some pet store employees insist on proper cage education before placing birds with new owners (some even going so far as to offer orientation classes), this is not always the case, which is why many owners have turned to the internet for cage purchasing information and selection. The BIG 3 Large Cage Links! Bird owners who have recognized inadequacies in their previous cage purchases like being too small can improve their birds' quality of life by upgrading to large parrot cages, large cockatoo cages, and even larger cages for smaller horizontal flight birds like finches . Bird-cage.com proudly supports the Cage xChange Campaign, which encourages owners to select healthier cages for their parrots. Click here for a handy chart that gives you guidelines on cage sizing by breed.